My mum who is highly suspicious of bees, wasps, gnats and ‘flying things’ finally met my bees this Saturday. She visited the apiary on the promise of no bees, ‘The bees will be sleeping because it is almost winter’, I said. This isn’t entirely true. Bees don’t sleep. But the apiary is generally quieter in late autumn and winter, except for a few bees taking a chance flight in a pocket of warm air and a few crazy beeks huddled around the apiary long table in the hope of tea and cake. A small crowd greeted my mum, step dad and me on Saturday afternoon and enjoyed watching my mother nervously approach the hive area. We visited Rosemary’s hive first and no one was flying so mum was very happy. ‘That’s very nice,’ she said of the hive. Opposite, Albert’s and John’s bees were active, but we walked past unnoticed. Next we visited Lavender’s hive and I attempted to show my mum the mouse guard. She raised her head from where she stood at the back of the hive and pretended to see it: ‘Yes, that’s very nice’. My step dad, Bryan, then became fascinated with inspecting the canal that runs behind the apiary. Meantime, I carefully lifted the roof off Lavender’s hive to see if they had drunk their syrup. About half an inch of syrup was left in the feeder and three bees were drinking. I beckoned my mum over so that she could see a real live bee, promising that it couldn’t fly out of the feeder. She quite liked watching it drink and said, ‘Ooh, look at that’. I quickly put the roof back to keep our bees warm. Emily and I probably won’t open our hives until the apiary does the oxalic acid treatment in December. We do this to keep down the levels of varroa inside the hive until spring. 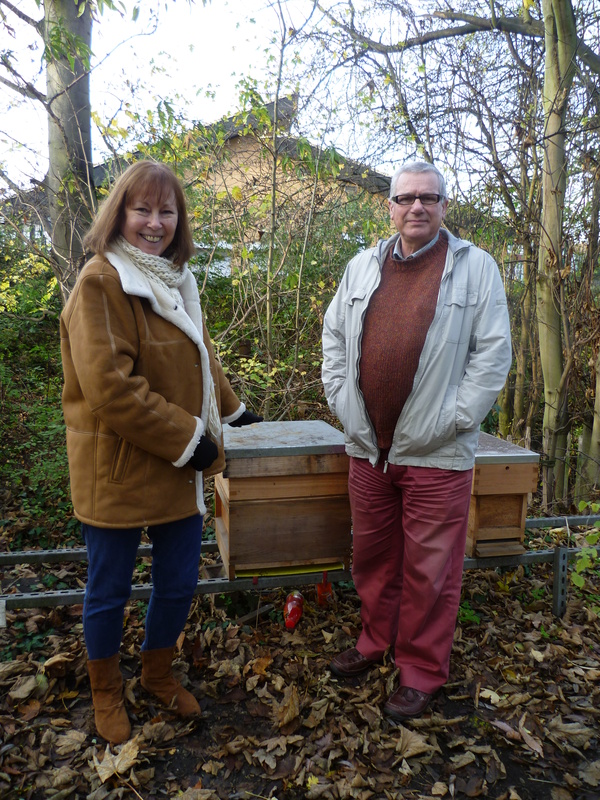 I pulled out the varroa board underneath Lavender’s hive and showed mum and Bryan a few varroa. Most of the debris on the board was clumped together in one area, which suggests that our bees are clustered on brood frames towards the entrance of the hive. So we left the bees in peace and went to enjoy a cup of tea. There was no milk and as my mum is not a hardened beek accustomed to drinking black tea I found her some coffee instead. Don arrived with his dog Annie, a gorgeous, friendly alsatian. Mum and Bryan love dogs (and so do I) so this delayed our goodbyes. As we left, my mum and step dad were invited by the beeks to come back for summer inspections on the promise of ‘much more bees and also cake’. This entry was posted in Beekeeping and tagged beekeeping, bees, honeybee by Emma Maund. Bookmark the permalink. He he look forward to meeting your mum and Bryan in the summer for some proper bee action! Is Lavender’s entrance reducer the right way up do you remember? Andy said it’s best to have the slot facing upwards so that if dead bees build up on the hive floor the live ones can still get out. You’ll have to bake a darn tempting cake to get my mum to visit in summer! Luckily (as my dad nailed the entrance reducer in place because he thought it shouldn’t move about) it is facing upwards. I just checked my earlier post photos of building the hive, thus proving that these blogs are a great record of the beekeeping year! And, if we need to take the entrance slot out there are tools to, um, un-nail it I am told. Phew, no worries about the entrance reducer falling out then! What’s your mum favourite cake flavour? She does like fruit cake or cakes with fruity fillings. When I was little my mum was famous for her ‘flat cakes’ because her cakes would never rise. Then we got a microwave and her cakes were wonderful. I actually really enjoyed meeting the bees and am much impressed by my daughter’s knowledge and commitment. “Way to go Em”, or something like that. Bryan and I also liked meeting Annie, she is lovely. Thank you to all the beeks for making us welcome. Thank you mum! Our bees are always well-behaved and if you visit in spring you may be lucky to see Rosemary or Lavender, our beautiful queens. Family reactions are pricless. My Dad, aged 90, is certainly very wary. Given he is a bit of a hero in my life it was quite weird to see his increasing discomfort as we got closer to the hive. He was born in Malta when his father was serving in the Navy there and then was brought up in London so I guess the idea of beekeeping was just quite alien. he had served and been in difficult situations in the war so any sort of fear seemed so misplaced. My grandson’s reaction was pricless. He could not understand why anyone would want bees. I explained that about a third of our food is pollinated by bees and it has been said that we could have real food problems if bees died out. What are you scared of, I asked – being stung? He admitted that but as soon as I explained that a bee suit could keep the bees out so why be afraid of something you can prevent, he seemed to have total acceptance where previously he had absolute resistence. It is quite bizarre to see such an about face of opinions.